Want to create a simple page? Choose a free one page theme on SiteW! If you want to create a one page landing, with only little content: SiteW is the ideal solution! Select a single page template that you will be able to use as a basis for your website creation. Then you will have the possibility to add all the elements of your 1 page website, by using the drag and drop technique. The one page examples of SiteW allow you to know how to make a single page website. You are the one who builds your simple website, and the one who manages and updates it, where and when you want. With SiteW, you will be able to create a free website, with absolutely no ads. Our service allows everyone to build a simple page and easily manage it. You can use our free one page responsive templates as single page application example, to start your own one page design. You will also be able to read our specific guides to get to know how to build a 1 page website. SiteW is there to help you create a simple website. A scroll down website is the ideal option, if you want to present a product, an event or a service, or if you want to create a showcase website. Thus the visitors of your one page website have direct access to the information you want to convey. Making a simple web page, that is also modern, is easy with our many web design features. Don’t worry, your one page website will contain no ads: it is the SiteW guarantee! Easily register a domain for your one single page, and improve it at your own pace. You can use our single web page templates and read our guides about one page design. All the contents of your single page is hosted on our cloud: no need to worry about it. Achieving a good ranking for your simple page is far from being easy: we help you with it. Share your scroll down website on social media, and easily improve your visibility! 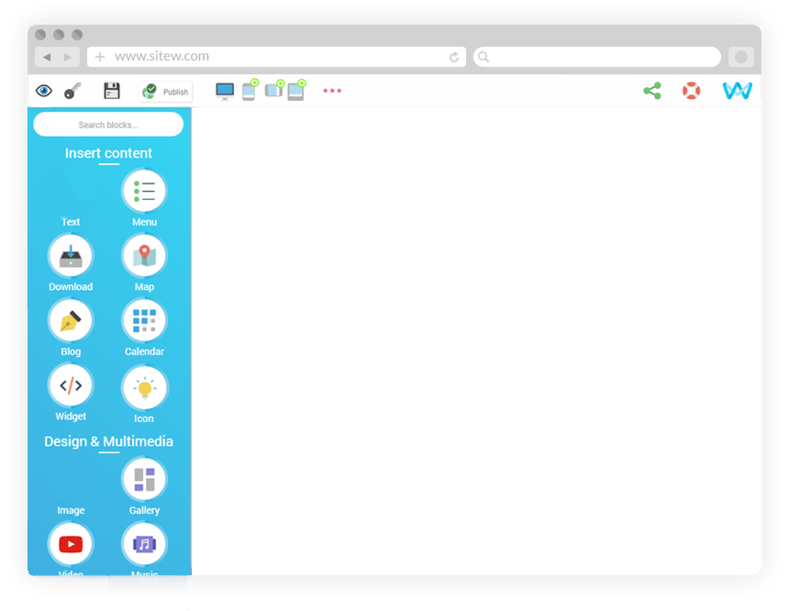 You can easily start a one page site with SiteW: it can be visited from any device.